Prices are Negative? That’s Un-possible! You are here: Home / Uncategorized / Prices are Negative? That’s Un-possible! As recently reported by Crain’s (http://www.chicagobusiness.com/article/20130620/NEWS11/130619723), Exelon has a pilot arrangement with PJM ISO to reduce capacity by up to 10% of its nuclear capacity when wholesale prices of electricity were likely to go negative. Seems fairly logical – who would keep going to work if you had to pay your company for the ability to work there? But, is that really the whole story here? In this article, I will be breaking down the market forces that are at work here to try to provide you with a better understanding of what’s going on here. I’ll be up front; I have a bias here. I don’t think Exelon should be cycling their nuclear power plants, and I don’t think wind power is to blame for their woes. So, if you see me start going in that direction, at least you know my bias, and can compensate for it. So, here goes. Prices are negative! That un-possible! In the market for wholesale electricity, prices do sometimes go negative. It seems odd, but understanding a little more about how wholesale prices are determined should allow you to understand how this can happen. Wholesale prices are determined hourly based on an auction for electricity that happens every hour of every day. These auctions are managed by the Independent System Operator (ISO) or Regional Transmission Operator (RTO) that manages the high-voltage transmission grid covering an area. In Chicago, we’re part of the PJM ISO (Pennsylvania – Jersey – Maryland Independent System Operator), while in the southern part of the state they’re part of MISO (Midwest Independent System Operator). So, now let’s take a look at what happens if the amount of electricity demanded by the market is very, very low. Picture it being 3am on a Tuesday morning in April – everyone’s is asleep, and the heat and air conditioning are all off because the outside temperature is comfortable enough to sleep in without them. Let’s face it; there’s very little electricity being used at that time, so demand is very low. Let’s look at what happens to our auction when PJM ISO requests 10 MW of electricity to supply the entire market. The decision process becomes a little more involved here, so let me take you a little deeper into what each plant operator is thinking at this time. And, the winner is … nuclear plant @ -0.1 c/kW! And, that is how the price of electricity is sometimes negative. How hard does the wind blow? Exelon is claiming that wind is increasingly the reason that electricity prices go negative overnight. Let me walk you through the logic as to how this could be the case, and then provide some statistics to demonstrate how it’s actually very unlikely to be the case in Illinois. b.) Wind farm = The wind farm has no fuel costs (wind is free! ), but it does get some money from the federal Production Tax Credit and from selling RECs. The federal Production Tax Credit provides a tax credit to wind farms as long as they produce a certain amount of electricity. RECs are the greenest of the electricity produced by the wind farm, and they are sold to people who wish to claim their electricity as renewable. (See this article for a deeper discussion on RECs – https://power2switch.com/blog/what-is-a-green-power-plan-how-its-different-than-the-city-of-chicagos-no-coal-provision/) So, the manager of the wind farm knows that as long as amount they get from the Production Tax Credit and from the RECs is more than the “cost” of they have to pay people to take the electricity, then she can still be making money. Wind farm = 10 MW at -3 c/kW. And the winner is… the wind farm and the nuclear plant! Wait, the wind farm’s price is lower than the nuclear plant. Why didn’t the nuclear plant win the entire thing? So PJM ISO is pretty smart too. It knows that the wind farm is dependent on the wind blowing, and that if the wind stopped blowing in the middle of the hour, then there would be a greater demand for electricity than what would be available. And powering up the nuclear plant at a moment’s notice isn’t going to work. So, PJM ISO has the nuclear plant and the wind farm share the load for the market price of -2 c/kW. Including the value of the Production Tax Credit and the sale of the RECs, the wind farm is still making money. 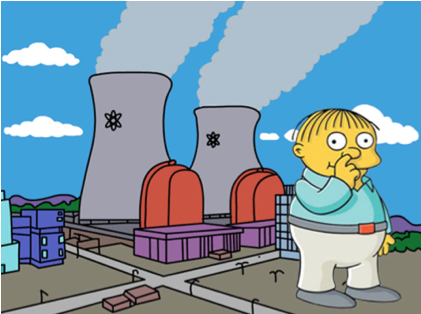 Don’t feel too bad for the nuclear plant. It seems like its losing money right now, but remember our “high demand” scenario where the nuclear plant was getting 7 c/kW? That scenario happens is less than 12 hours away. So, how is it that 5.2% of the electricity generation in Illinois that’s coming from wind having such a profound impact on Exelon’s nuclear plants that they can’t afford to keep them operating? Something smells fishy, and it’s not the wind farms. Let’s ask ourselves for a second what the impact is of idling a nuclear plant or two in the PJM ISO. Well, the most obvious point impact is that there’s now less supply. Going back to our Econ 101 class, if demand remains constant, but there’s and decrease in supply, then there will be an increase in price. That seems pretty straight forward. But, where’s the biggest impact on price going to occur? Take our “high-demand” and “low-demand” examples from above. These are two snapshots for the 24 hourly auctions that are run by PJM ISO. These are the two extreme cases, with the demand in the remaining 22 hours sitting somewhere in between. Imagine that each of our “plants” actually represented dozens of plants that shared those similar characteristics. If we assume that Exelon plans to idle 10% of the nuclear “capacity”, then the amount of electricity coming from the nuclear plants will be 10% less. If you run the example for all 24 hours in the case of full nuclear capacity, and re-run the example for all 24 hours with a reduced nuclear capacity, you’ll see that prices increase for all hours of the day. Not only that, but you’ll see that coal, the most expensive and environmentally harmful of all the plants, produces a much larger percentage of electricity. I’m not saying that Exelon is idling nuclear plants in order to create more pollution. That just doesn’t make sense. But, what I am saying is that Exelon owns a large number of nuclear power plants in Illinois, Pennsylvania and New Jersey, which are also serviced by PJM ISO. (The “P” in PJM is Pennsylvania, and the “J” is Jersey.) The cost of idling a few nuclear plants is more than covered by the increase in revenues Exelon’s other nuclear plants will experience due to the higher market prices. So, Exelon as a whole will make more money. Exelon is by far the largest owner of nuclear generation in PJM ISO, and I’d hate to see it take advantage of its market position in order for it to make greater profits. And, I am vehemently opposed to it if those higher profits are as a result of me having to pay more for my electricity! Read my lips Exelon – No nuclear taxes (increases) on my electricity bill!